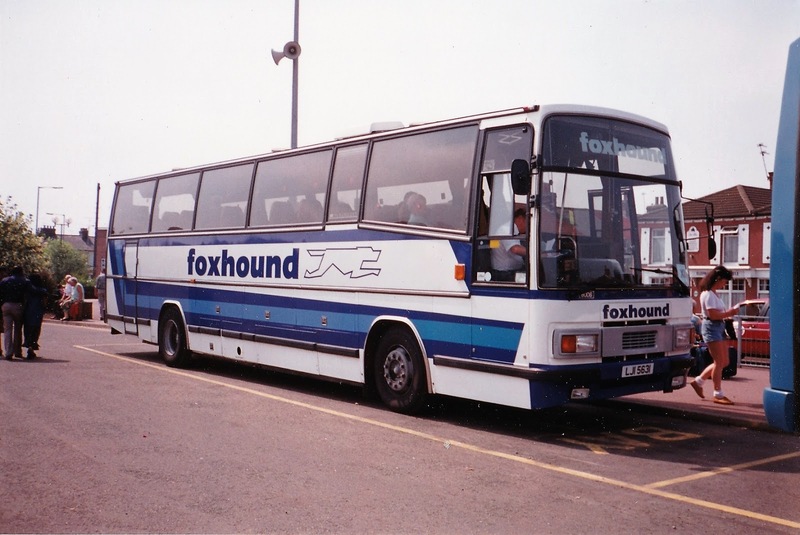 This week's #TBT Throwback Thursday features a coach from the Great Yarmouth based Ambassador Travel fleet. 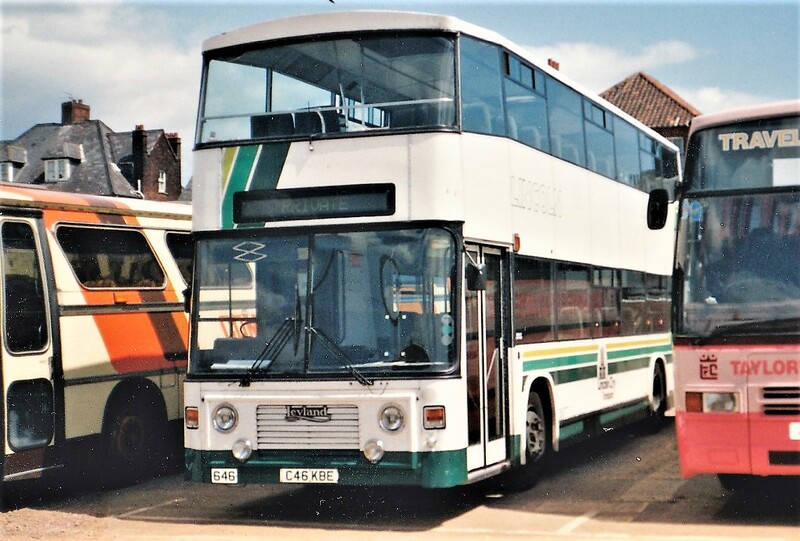 The photo shows H167EJU at Kings Lynn's Vancouver Centre Bus Station in the early 1990s, when Eastern Counties ruled the roost. The coach was a Plaxton Paramount 3500 bodied Volvo B10M new to the operator in April 1991 as their 125. It is seen on the National Express 308 service to Aberdare, originating from Great Yarmouth. From September 2015 National Express cancelled the service which by then had then been terminating at Bromborough (near Birkenhead) However, the service now runs as far as Birmingham as the 371. A few changes to local bus services to report in today's Notices & Proceedings Report published by the East of England Traffic Commissioner. Anglianbus is to amend the timetable of its Bungay to Lowestoft 61/61A/61B/61C services from 13th November 2017. National Express is to vary the timetable of its 490/1 services between Lowestoft Bus Station and London Victoria Coach Station, via Great Yarmouth, from 6th November 2017. The operator is also to cease the one daily 497 run between Great Yarmouth and London Victoria Coach Station, via Lowestoft, from 13th November 2017. Venturer Coachways of Brightwell in Suffolk surrendered its operational licence with effect from 18th September 2017. Unfortunately I didn't make the East Anglian Transport Museum's Trolleybus Weekend on Sunday as intended, although I understand it was a successful event involving the running of ten trolleybuses from seven different cities and towns. That meant I missed the running of First Eastern Counties heritage liveried YG02DKU on the free Park and Ride service between Ashburnham Way and the museum. However, Cameron Robinson sends in a photo of it on one of the runs during Sunday. A scene soon to disappear after November this year? Wow! The last twenty four hours have certainly thrown up a couple of surprises! The second surprise, is this morning's announcement by Zak Nelson of the impending closure of the Norwich Bus Page, although he will continue to keep the Facebook site going. 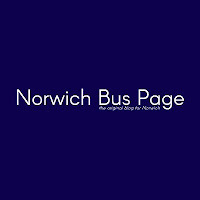 Its a bit sad to see this happening as Norwich Bus Page was always seen by us as a healthy competitor in those early days and, despite its name, used to concentrate initially on activity in the the Great Yarmouth area! That doesn't leave many of the 'famous five' continuing to blog regularly. Good luck in whatever you do Zak and hope to continue to see you on the enthusiast circuit. What a busy 24 hours of surprises its been then. Many local operators have announced changes on their websites regarding their winter services. 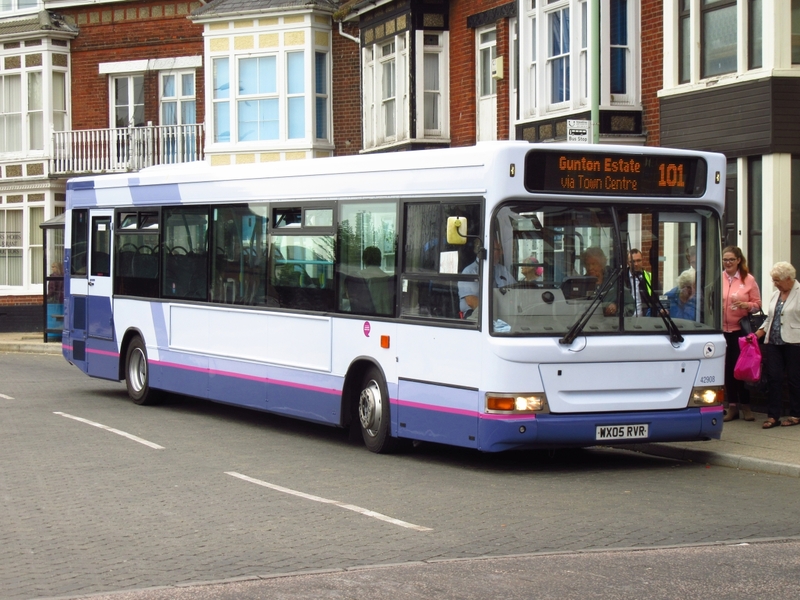 From 3rd September there were also minor changes implemented on First's Lowestoft Town Services 99/99B to Southwold, 103 to Burnt Hill and 106 to Carlton Coleville; plus a route amendment on the last mentioned. Firstly a couple of photos from today to share. Latest arrival for Reynolds we reported last week is a Mercedes Mini coach YX07AWM, this has now gained Fleet names and has been named 'Lady Joanna'. Seen below at The Ormesby Road Garage this afternoon. I also managed to catch up with the latest repaint at First Great Yarmouth today, 42929 SN05EAJ has returned to Service and had its various numbers and lettering applied. Finally a couple of moves to report, Volvo B9TL's 37141/37142 (SN57HDA/HDC) have gone to Norwich on Loan from Great Yarmouth this afternoon. 37142 pictured at Caister Road in July this year. 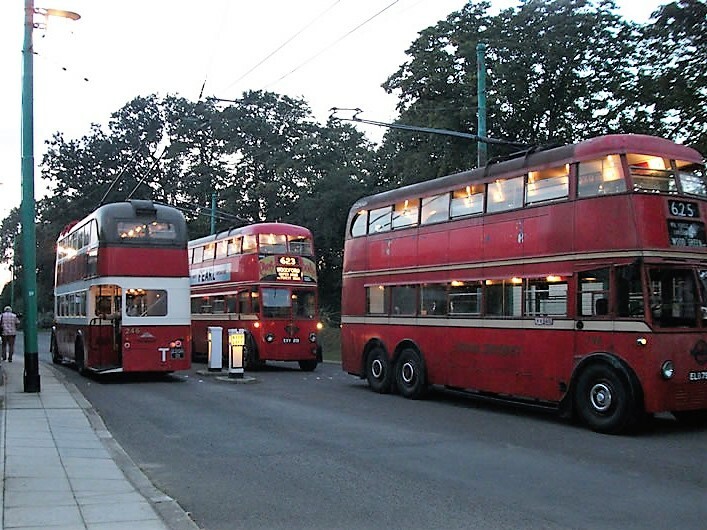 Tomorrow sees the beginning of the annual Trolleybus Weekend at the East Anglia Transport Museum at Carlton Colville. Star of this year's event will be Teesside trolleybus No.11 (291) which appears following extensive restoration work. 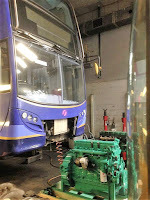 This will be the first time this trolleybus has been at the museum for many years and it is expected to be one of at least ten trolleybuses in service over the weekend. As usual free vintage bus services will be operated to Lowestoft & Beccles with First Eastern Counties kindly providing the park & ride service. Further information is available on the East Anglia Transport Museum's website. It was subsequently acquired by Stephenson's Coaches of Rochford in Essex who, in turn, sold it on to MacPherson (?) during 2006 and it's there that the trail runs cold. Further to Roy's post in which he reported Excel liveried Gemini 37578 AU58EDJ working Town service 6 this afternoon another strange allocation saw Norwich Turquiose Line Gemini 36173 BD11CFX employed on the 1B service to Hemsby. I would guess it is due an MOT at Caister Road in the next few days. It was later employed on the 1/1A route between Lowestoft and Martham and arrived at Ormesby Royal Oak this evening just in time for another photo opportunity with Simon at the wheel. Today also saw the return of repainted Dart 42929 SN05EAJ from Simon Morris in Ipswich, fellow Yarmouth Dart 42919 EU05AUL has now been taken up to Ipswich for its turn in the paint booth. Many Thanks to Simon for use of his photos. After successfully completing my quest to get a photo of a First Excel decker on the 6, I thought I would hang around (after finishing the shopping!) to see what would turn up on the Borderbus 14:16 Bungay to Great Yarmouth 580 service. I was hopeful in that it might be one of the two remaining red liveried Scania OmniCity deckers and, surprise surprise, it was! However, the registration threw me completely as it had special plate BB57BUS. Now was it LX59CNC or LX59CNJ? A prompt reply to my tweet to BorderBus confirmed it was the latter which also now has the fleet number 210. The 'new' trio have displaced the former Volvo B7TL/Wright Geminis BB03BUS, LF52ZPB/C which have gone to Scania in exchange. Incidentally the other red Scania carries the registration BB58BUS, fleet number 208 and was previously LX59CNC. BorderBus is currently awaiting certification for the newly painted 209 LX59CNE (see BorderBus Repaint) before the next one goes away for the same treatment at Hants & Dorset Trim. The operator also reports that the 580 Bungay to Great Yarmouth service is doing extremely well and proving to be very popular. This afternoon, whilst I was heading to Gorleston High Street, a First Eastern Counties Excel liveried double decker was noted on the 1335 Great Yarmouth to Bradwell route. I intended getting a photo of Gemini AU58EDJ's return working, the 13:53 departure from Bradwell. The first picture, taken on Church Lane, didn't show the destination so a quick sprint to the High Street stop ensured I got the result I wanted! Just a couple of entries relating to local bus services feature in today's Notices & Proceedings Report published by the East of England Traffic Commissioner. North Walsham based PTS Group (Norfolk) Limited has had its application granted for a three vehicle operating centre at Tilia Business Park off Tunstead Road in Hoveton. 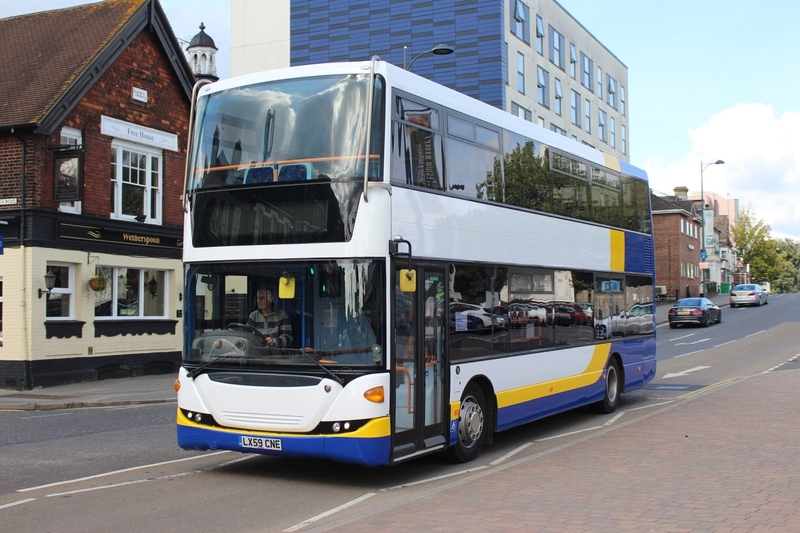 One of the three recently aquired ex Stagecoach London Scania Omnicities has been away at Hants & Dorset Trim for refurbishment and conversion to single door. LX59CNE (ex 15139) is now in Borderbus colours and was captured out on at test run in Eastleigh a couple of days ago. During the past few days Anglianbus has published its latest fleet list on its website with a few significant changes to report. Since the operator's last update, Scania OmniCitys 461 and 462 (YN05HFG and YN03WRJ) have been withdrawn; whilst its last Scania OmniDekka 554 (YN55PZC) joins former Anglian YN55PZF at Chambers. The listing is dated 8th September and shows no Konectbus vehicles on loan. The fleet has now slimmed down to just 23 vehicles. As you can see from the comments section of the original post, I have subsequently received an update that it's 'still going strong' in North Wales. 'Motor Movies TV' tells me that R354RCJ is now with Lewis-y-Llan Bus & Coach Hire of Amlwch on the Isle of Anglesey; having transferred there soon after I had prepared the original post! 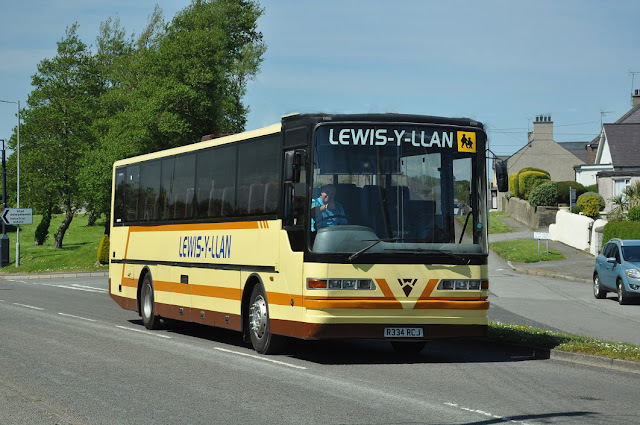 Graham Ashworth has kindly provided a photo of the coach with its new operator still retaining the livery applied by Wilkins Coaches of Cymmer. My thanks to Graham for the photo and to 'Motor Movies TV' for the update. Whilst out and about for work today, i came across a former Reynolds Of Caister vehicle which had recently been sold. It has passed to Chet Coaches of Chedgrave near Loddon in Norfolk. Currently on hire to Anglianbus is Konectbus Optare Versa MX08UZT which I noted in use on Tuesday on the 61 to Great Yarmouth. As usual, I was driving and, therefore, unable to get a photo of it when seen on Gorleston's Brasenose Avenue working the 15:10 from Kessingland. However, Simon Bartram was able to get a photograph of it this morning on a similar 61 working at Lowestoft's Gordon Road. My thanks to Simon for the use of his photo. Meanwhile, First Great Yarmouth have First Lowestoft's Alexander Dennis Enviro200 45116 (VT09JPT) on hire. Many thanks to Simon Taylor for the use of his photo. 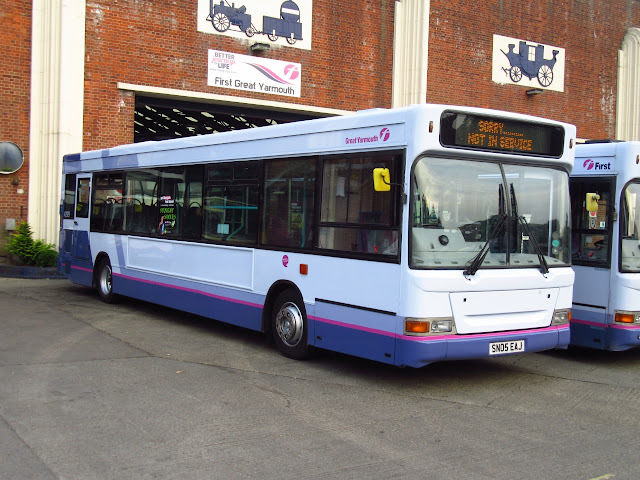 Going back in time this week we revisit long gone local independent Flying Banana, otherwise known as Halesworth Transit. The photo shows a Dormobile bodied sixteen seated Freight Rover 365 at the operator's Yarmouth Business Park premises in the early 1990s. Registered D789RFM, it was one of five similar minibuses on long term hire from Carlyle of Birmingham commencing in 1991. 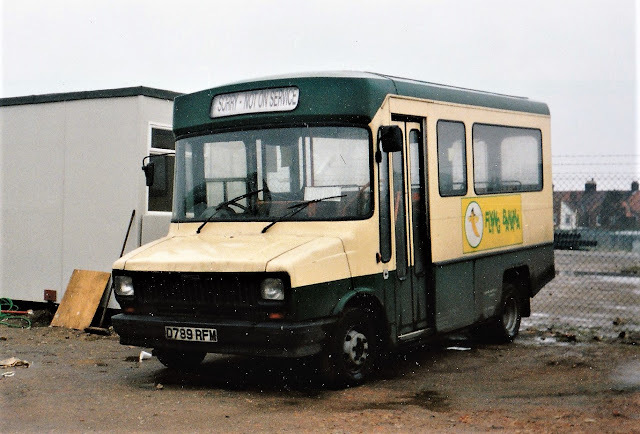 As for D789RFM, it was new to Crosville in November 1986 receiving fleet number MSR789. Like the proverbial bus, you wait for ages for a post and then three turn up on the same day! Our third post relates to a Beestons coach which was one of twelve at Great Yarmouth's Beach Coach Station earlier today. Again just three entries regarding changes to local bus services feature in today's Notices & Proceedings Report published by the East of England Traffic Commissioner. All relate to services provided by Anglianbus with the first advising of retrospective timetable changes on the 61/61A/61B/61C routes between Bungay and Lowestoft commencing on the 4th September 2017. The same operator is also cancelling its 60S service between Beccles and Southwold plus its 60H route from Beccles to Halesworth from 29th October 2017. Both are provided under a Suffolk County Council contract. An unusual vehicle arrived at First's Great Yarmouth's depot during yesterday evening. It was previously a double deck Volvo Citybus which has since been converted for use as a mobile theatre. Grey liveried Alexander RV bodied G91PES is in the town for use at the Out There Festival being held in Great Yarmouth over this coming weekend. Owned by Halifax based IOU Limited, the bus has been completely rebuilt behind the cab with theatre style seating facing backwards. It was new to Tayside in Scotland in late 1989 and there is a photo on Flickr taken in September the following year. IOU subsequently acquired it from Hilton Coach Travel of Newton-le-Willows by the April of last year. My thanks to First Great Yarmouth for the photos. Yes its Thursday again and this week's Throw Back Thursday (#TBT) is the last in our six part series featuring visitors appearing at Great Yarmouth's Beach Coach Station during August 1994. Today's subject is Midland Fox's Plaxton Paramount bodied DAF MB230 LJI5631. Numbered 8006 in the fleet, the coach was new to Welsh of Upton in March 1985 when registered as B568HJF. Apart from a reference that it was observed in Pauls Coaches yard at Harriseahead, Staffordshire in July 2007, I can find no further information about the vehicle. Locals will note that the Elephant & Castle Public House on Nelson Road North can be seen in the background of the photo. It was then still in use as a pub but has subsequently been converted for housing. Lowestoft based Dart 42908 WX05RVR returned to service today after repaint into First Olympia livery at Simon Morris in Ipswich. I managed to catch up with it on my way home this evening at the Bus Station in the town. Great Yarmouth based Dart 42929 SN05EAJ has gone down to Ipswich to be next in the paint shop at Simon Morris. Three entries regarding changes to local bus services feature in today's Notices & Proceedings Report published by the East of England Traffic Commissioner. There are two applications to vary two existing services by Coastal Red and Sanders Coaches. The former relates to the alteration of the timetable of its 36 route between Hunstanton Bus Station and Wells next the Sea from 30th October 2017. 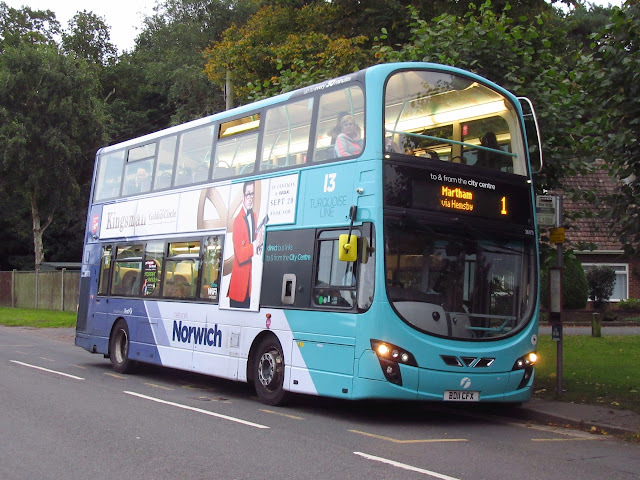 The latter concerns the retrospective timetable amendment to its 43/43A/43B services from Reepham Market Place to Norwich Bus Station from 3rd September 2017. D R Fosdike Limited of Halesworth has received consent to use premises at Fairview Road in the market town as an operating centre for one vehicle. 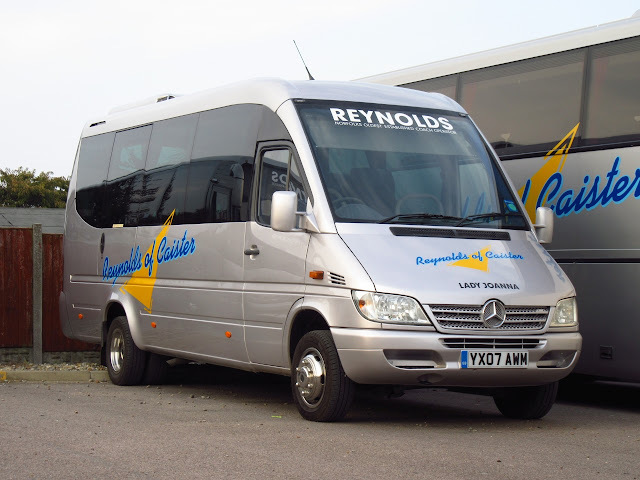 Another addition to the fleet for Reynolds of Caister is a Mercedes Benz 413CDI 16 Seater Mini Coach YX07AWM, it was new previously with Star Cars, New Barnet and Translinc of Lincoln before heading to Norfolk. Thanks to Will Drake for one of the photos. Regular readers will have seen my reference to a new coach operator in our area - Jubilee Coaches of Rollesby. With the beginning of the new school term I am able to reveal that the 'new kid on the block' has secured three of the thirty five Norfolk schools tenders up for grabs. They have won two tenders serving Stalham schools with the other centring on North Walsham. I have previously reported that Jubilee have five coaches in the fleet and they include two former Venturer Coachways Dennis Javelins L333JCR and L444JCR. The special plates hide their former identities of N43AHH and R682DWS respectively and both have Jubilee Coaches white and branding. Robert Kelly tells me that R682DWS was new to Stevens of Bristol in February 1998 whilst L333JCR was new to Windsorian of Windsor in April 1996 as N333ASH. 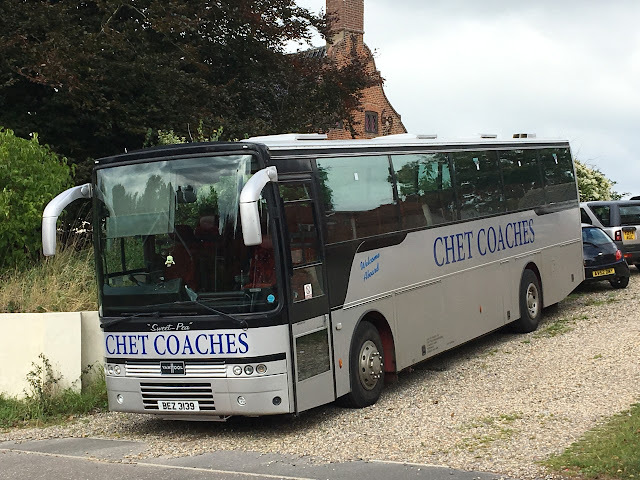 The three remaining members of the fleet have recently been acquired from Norfolk Coachways with photos of Bedford YNTs VJI8206 and A400NNK already appearing on the blog. The third is another Plaxton Paramount 3200 Bedford YNT registered A838PPP which retains Norfolk Coachways branding at present but is to be refurbished and repainted in due course. My thanks to Kevan Portas for his assistance in preparing this post and for the use of his photos. Thanks also to Robert Kelly for providing the historical information. More than a dozen coaches were at Great Yarmouth's Beach Coach Station during yesterday afternoon including two from the small West Row Coach Services fleet based in Bury St Edmunds. They were Scania/Irizar W914BEC and Beulas bodied Irisbus YN57AEV with the latter being purchased from Man of Gravesend during July 2014. An impressive arrival was A16LNX, a Neoplan Starliner Airlynx Express coach. 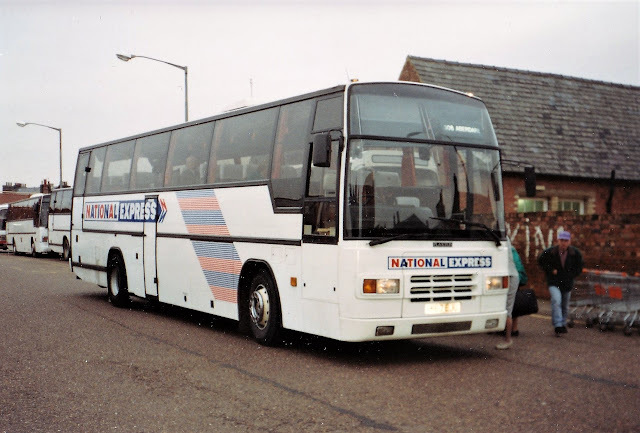 The operator is based in North Baddesley in Hampshire and acquired it from Ellisons Coaches of St Helens on Merseyside when it was registered ML62OHG. News from First's Great Yarmouth depot is that Excel liveried Alexander Dennis Enviro400 33817 (YX63LKF) is to shortly receive a new engine. Normally based at Kings Lynn, it is seen here at Caister Road awaiting the transplant. 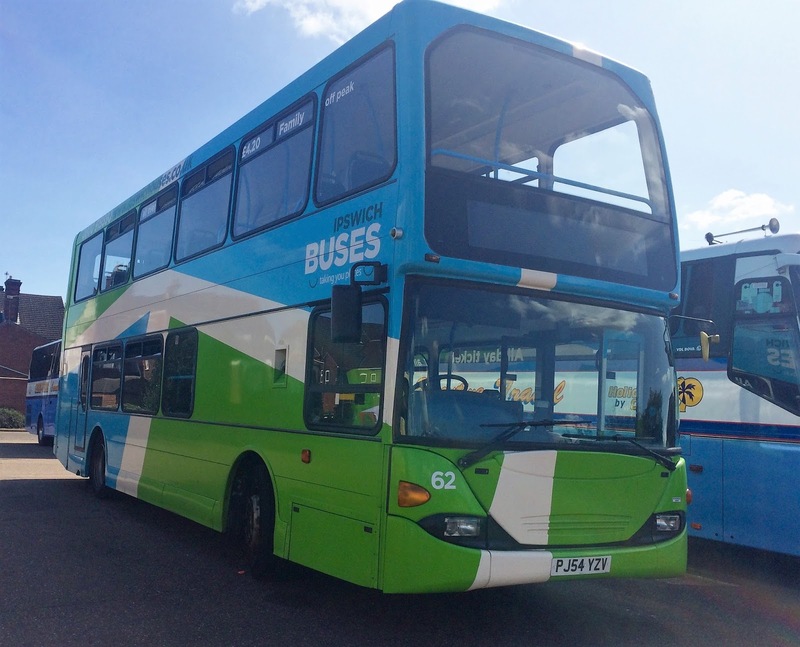 A second member of the Excel fleet is also visiting the Great Yarmouth workshops with Lowestoft Enviro400 33821 (YX63LKL) due to have its MOT. Lowestoft's Dennis Dart SLF 42908 (WX05RVR) has arrived at Caister Road from Simon Morris following a repaint with Great Yarmouth's 42929 (SN05EAJ) taking its place in the Ipswich paint shops. 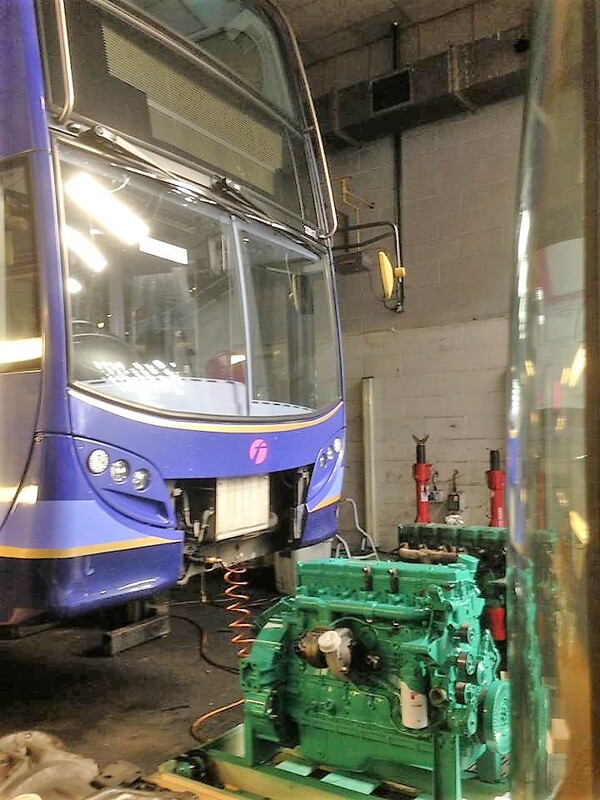 As previously reported, Wright Eclipse bodied Volvo B7 66344 (MV02VCX) is away at the moment continuing to have a new engine fitted. Meanwhile, former First Leeds Volvo B9TL/ Wright Eclipse Gemini 36199 (BN12WNZ) is returning off loan back to its home depot of Norwich this weekend. It is seen here at the traffic lights on Bridge Road in Southtown late this afternoon making its way to the James Paget Hospital in Gorleston on service 8. My thanks to our contacts at First Great Yarmouth for the information. Today saw the first day of public service for the recently repainted Volvo B7L 60916 YG02DKU. It has gained the old Eastern Counties Post Office Red livery and has also been given the special fleet number VW916, It was employed this afternoon on the 24 service. A quick message to a friend who was out and about with a camera and within minutes we had a shot of her in use in the September Sun! Many Thanks to David Oakley for the use of his Photograph. Further to yesterday's Throw Back Thursday post concerning an Ipswich bus appearing at Great Yarmouth's Beach Coach Station during August 1994, I looked in there again yesterday and found another Ipswich bus there some twenty-three years on! The guest from the Suffolk county town was East Lancs bodied Scania N94UD PJ54YZV which has made many visits before. Numbered 62 in the fleet, it was on a day's excursion from the town. 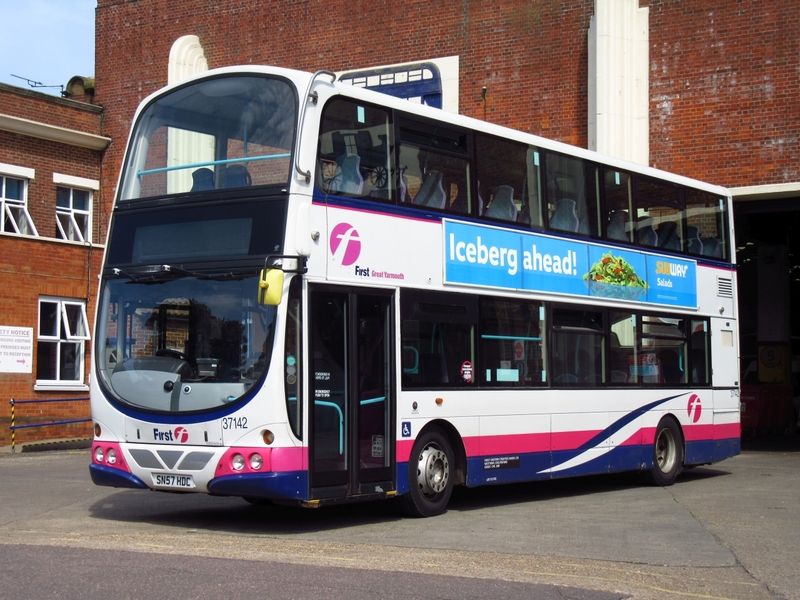 The Ipswich theme continued with former First Ipswich 66979 (KX05MHF), one of three Volvo B7RLE Wright Eclipses moving to First Norwich in late June, being employed on the 2 from Market Gates. service 1 from Martham to Lowestoft. It is seen here in the gloom of Market Gates and it is possible that it was being used as a replacement for Yarmouth's Dart SLF 42929 (SN05EAJ) which has gone away for a repaint. 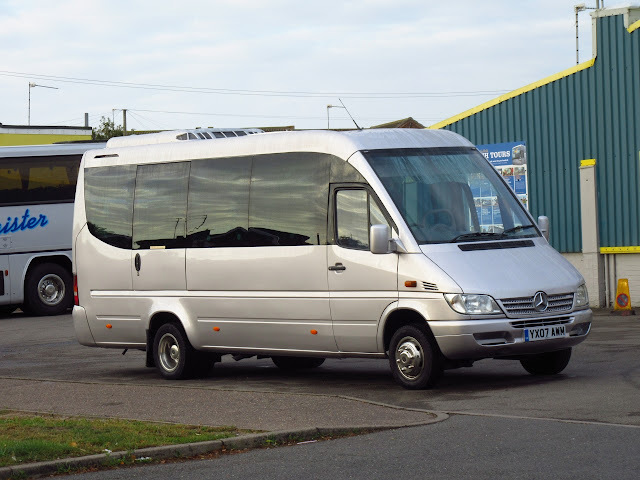 Hello and a warm welcome to the East Norfolk Bus Blog from Grahame and Roy. Thanks for visiting us. Entering its ninth year, the blog concentrates primarily on bus activity within the East Norfolk and East Suffolk coastal strip centring on the towns of Great Yarmouth and Lowestoft. If you would like to contribute any reports or photos these can be received by email or via twitter and facebook. All are gratefully received! 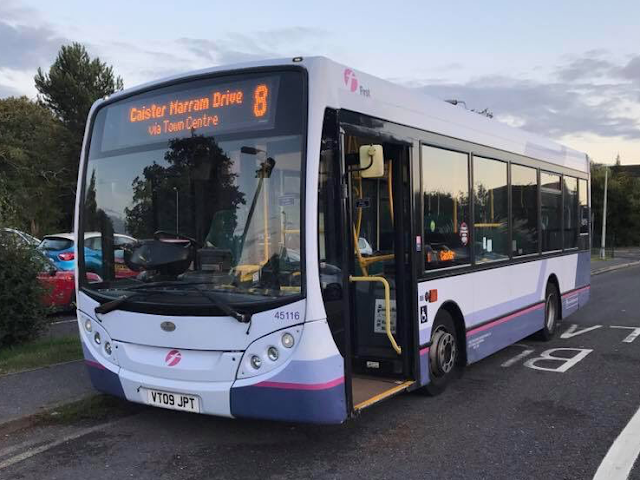 * Please note that all information contained within this blog is copyrighted to East Norfolk Bus, unless otherwise stated. * Also the views and opinions expressed in this blog are entirely my own, unless, again, specifically stated otherwise. * This blog is not directly connected in any way to any of the companies mentioned. * Information contained in 'Bus Enthusiast Sites' and 'Local Operator Websites' is outside the control of East Norfolk Bus and is the responsibility of the companies/individuals concerned.